First of all, we would like to thank each and every single one of our participants in our counsellor survey. The time that you spent on completing this survey helped us to create a clearer picture of what roles school counsellors played in their place of work, as well as their working conditions. We had an analysis of the data done by a PhD student, and below, we have listed some of the more pertinent results. 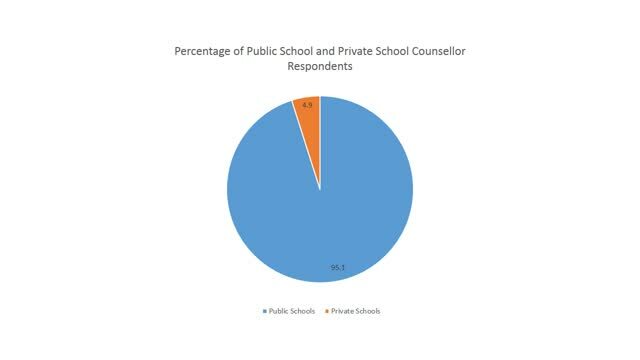 573 counsellors completed the survey, of which 142 were counsellors at the elementary level, 40 at the middle school level, and 391 at the secondary level. 95.1% of counsellors worked in the public system, and 84.6% had completed a Master’s degree or higher. Of those counsellors that had completed a Master’s degree, 82.8% had a supervised practicum as part of their degree program. In terms of caseload, 65.3% of survey participants were responsible for more than 300 students, with 31.5% having between 301-400 students, and 20.6 having between 401-500 students. When looking at counsellor responsibilities, the top three topics which were most important to the participants were as follows: Mental health concerns (88.8%), Relationship concerns (71.8%) and course selection/planning (55%). Please keep in mind that course selection/planning seem to apply mostly to secondary and middle school counsellors. In terms of how counsellors felt others believed were the most important topics for school counsellors to address, it seems that mental health concerns still top the list, aside from counsellor perceptions of the parental perspective. As school counsellors, we often work on our own, and as such, opportunities to confer, communicate, and learn with our colleagues come at a premium. An overwhelming number of participants (92.3%) want more opportunities for professional development, with the greatest barriers to this being a lack of funds and the lack of release time during school hours. The last two areas we would like to touch upon in this overview are concerns/issues that school counsellors have dealt with in the past year, as well as what they would like to see change in the school counsellor profession. The top 3 issues with which the survey participants dealt with the most frequently in the past year were anxiety (81.2%), peer relationships (73.7%), and depression (42.5%). There were many other issues that counsellors dealt with, of course, but these 3 were the most commonly reported by the survey participants. When it comes to our profession, there are as many opinions as there are counsellors. Due to this, teasing out the factors that are most important to counsellors about our roles and responsibilities is a necessary process in order to more clearly delineate our positions. The factors that the survey participants felt were most important to change included the following: access to community support services in a timely manner (53.4%), caseload size (43.8%), availability of Pro-D money (42.1%), and access to counselling collaboration opportunities (41%). As this survey was meant to be more of an exploratory and preliminary survey, much of the data collected was informational and descriptive. We invite you to take a closer and more detailed look the survey results at [the following location], and then to contact us with comments and/or suggestions. Despite the lack of specificity in this particular survey’s questions, several themes and patterns seem to emerge. Mental health concerns as well as access to community support services are high on the priority list for school counsellors. It is also noteworthy that anxiety is an issue that a large majority of counsellors dealt with on a weekly basis, and that despite the caseload sizes and the paperwork expected of us, the majority still feel that administration and staff understand that mental health is still our primary concern and responsibility.